@Hyperscalper, are you having delayed fills with FinPro now? I have been throttled down to 0.50 second (average) execution times down from 0.08 - 0.20 average as of the last few days. I’ve been screaming at them to no avail about it, so I can only assume it’s their LPs doing it. I am finished with them as they’ve had too many data outages that have cost me, with no recourse after the first incident on their part. Shameful really, as I thought my MT4 dealer search was over! wow really? OK. that’s news to me, and I still don’t believe it to be accurate. offshore [I]banking[/I] i could see as a problem, but not trading. The information provided by Mr Green is totally incorrect, and Mr Green has exhibited a total lack of knowledge regarding the subject of offshore trading in his communications with Tallinex. The ONLY reason why most offshore brokers refuse to accept US residents is because their jurisdiction requires them to be registered with a local regulatory body, and that regulatory body has stipulated that its members may not have US-resident clients. Such stipulation is made as a favour to the SEC (since there is no legal basis for such a rule), and affected brokers are forced to comply under threat of termination of their registration with the local regulatory body (which would find them trading illegally and subject to prosecution in their country of domicile). This is why the offshore brokers that DO accept US residents are based in jurisdictions where registration with the local regulatory body is not a requirement (or, as in the case of Belize, the local regulator is not actually providing any form of regulation because members are expected to ‘self-regulate’). As long as you report your offshore trading accounts and any profits / losses to the IRS then there is no issue but, being completely oblivious to the actual legal situation, Mr Green contacted Tallinex at the end of December and stated his intention to report Tallinex to the Enforcement Division of the SEC. The SEC has subsequently contacted Tallinex regarding US-resident clients, but the communication made it quite clear that they were powerless to take action. If anyone using the services of Mr Green is trading with an offshore broker then I would only state that you may be drawing unwanted and unneeded attention to your broker, and possibly their local regulator (in addition to receiving incorrect advice). yep…just pay your taxes. THANKS FOR THIS POST! Thanks to Mr Green, pretty soon US clients will have no brokers to trade with. Tallinex keep up the good work. Green if you are reading this thread, stop DRAWING UNWANTED ATTENTION!!! I can confirm this statement from Paul Cullen, our Tallinex rep.
Paul and I have been corresponding privately regarding this matter since before Christmas, and we both agree that Robert Green is trying to play Sheriff (or maybe Snitch would be a better description) in matters he doesn’t understand. I would add to what Paul said above, that you may be drawing unwanted attention to [I]yourself,[/I] as well. The CFTC and their sock-puppet the NFA, and their fellow regulators like the SEC — hate [I]off-exchange[/I] retail forex trading. They hate [I]offshore[/I] trading, they hate [I]those of us[/I] who trade offshore, and they hate [I]this thread. [/I] They are not above enlisting the assistance of the IRS to harass, audit, and prosecute individual traders, like you and me. Appreciate the heads up. Services that are experienced enough to help with tax prep with offshore trading are few and I can see the agencies attempting to bully and strong arming such services as tax and legal professionals into snitching or simply avoiding offshore traders, in effect making it harder to do the right thing. Must be like a game to them, divide and conquer using all means necessary. Clint do you have good tax people? It is easy to do it yourself. Use freetaxusa.com or turbotax. Just follow directions on their website. You do not need fancy tax man. They usually full of **** and charge lots of money. Thanks Marc. I googled turbotax forex and they said by default it is treated as 988.No mention of 1256. 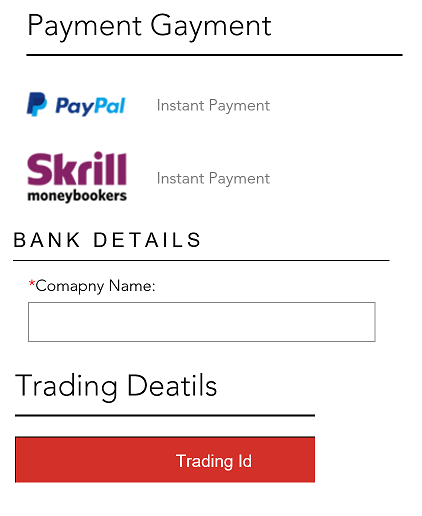 Hi, I have signed up with Finpro trading and I was browsing through backoffice website and there were couple of big spelling errors… hmmm… and what does “gayment” mean? I posted something to the same effect a while ago but I am trading with Tallenex and they have been very professional, helpful and fair. I am a newbie to this forum. I just ran across (and joined) this forum and thread today and I am quite happy to find this discussion. I have been trading forex since 2008 using EA’s, and am currently trading an account at FXCM and also Forex.com. I was just this past week made aware of and opened an account at Berndale Capital, but have not funded it yet. This thread has made me feel much better about trading offshore out from under the thumb of big brother. Thanks to all and I will be “listening” to this thread with great interest. on the legality and ethics of offshore forex trading. I started a Thread in the [I]Melting Pot[/I] forum to post exposés of the Panama Papers scandal, as it unfolds. For those who have not been following the news, the gist of the story is this: The largest hack of data in history has exposed a huge client list of individuals and companies involved in tax evasion and money laundering, utilizing offshore tax havens, all funneled through one law firm in Panama. The client list revealed in this hack includes heads of state, heads of companies, heads of sports syndicates, heads of organized crime networks, and vast numbers of high-net-worth individuals. Active participants (and active readers) in our Offshore Broker thread know that the offshore activity exposed in the Panama Papers scandal bears no similarity to the offshore forex trading we promote in this thread. But, newcomers (and casual readers) in this thread might not understand the difference between the “offshore” scandal that’s erupting from Panama and the “offshore” trading we do here. We have an enormous community of casual readers — this thread has been viewed over 700 thousand times. But, those “views” are mostly by people who don’t post here, don’t trade offshore, and likely don’t know the details of what we do here. So, some explanation is in order. • [B]The word “offshore” does not connote or imply anything illegal, unethical, or unsavory. [/B] The offshore forex trading we are engaged in here is not illegal. It is not prohibited by any U.S. law. Furthermore, it’s purpose is not to facilitate money laundering or tax evasion. Rather, it’s purpose is to allow us to trade in a relatively free environment, away from the oppressive regulations of the CFTC. The CFTC would love to have the legal authority to shut us down, but they don’t have it. • [B]The word “offshore” doesn’t even imply secrecy. [/B] On the contrary, everything we discuss, advocate, and do is done right here, in the open, in a public forum — which the CFTC, the NFA, and the IRS can, [I]and do,[/I] read on a regular basis. Furthermore, our offshore trading accounts are reported to the IRS and taxed as required by law. We have said again and again in this thread: Comply with the IRS regulations regarding the reporting of offshore financial accounts, report the gains and losses in your offshore forex accounts, and pay your taxes. • Some very bad actors are being exposed in the Panama Papers scandal. Many of them deserve to be hunted down and fined, or jailed. And I, for one, hope that happens. Their criminal activities, concealed and carried out in offshore locations, give “offshore” a bad name in the minds of people who fail to understand the details and distinctions. We won’t be painted with that brush, because what we do offshore bears no similarity to the scandals being revealed in the Panama Papers. Yes, good post Clint. No need to condemn forex brokers for being offshore if they do it for good reason and according to laws. Don’t forget Google and Facebook are some of the largest offshore company structure users and basically every top tier bank like Barclays, HSBC etc all have offshore sister companies. Lastly offshore is not a structure for the rich and “elite”. It is actually quite cheap and easy to open an offshore company. RJ9000 and Nasir, Thanks for your kind words, guys. …offshore is not a structure for the rich and “elite”. It is actually quite cheap and easy to open an offshore company. The offshore trading we are discussing and promoting in this thread does not (necessarily) involve opening an offshore company. Nor does it involve travel to an offshore location, or opening an offshore bank account. In the simplest scenario, a U.S. resident (or a resident of any other country, for that matter) can open a live trading account with an offshore broker who accepts U.S. clients, and can fund that account, completely online from home. And that, in fact, is how most of us here have done it. The new Berndale website homepage is now up and running. I was just this past week made aware of and opened an account at Berndale Capital, but have not funded it yet. This thread has made me feel much better about trading offshore out from under the thumb of big brother. Welcome to this thread. I’m glad that it’s been helpful to you. And thanks for posting about Berndale Capital. After you’ve had some experience with them, please give us an update. For those of you who have opened live accounts with LMFX, this is a request for an update on your trading experience. On March 31, we tabled the LMFX request for Trusted Broker status (for a month), but it’s still pending. In order to make an informed decision on that request, we need more feedback from those who are actually trading with LMFX. If that’s you, please post your comments and opinions. I’d like to be able to make a definite decision on the LMFX request by (let’s say) Monday, May 2.
re FinPro again, up until about 10 minutes ago I have had lightning fast (avg 8.2ms) execution times. Now I’m up to 32ms avg. EDIT: average fill time is now about half a second. ugh. Hoping this is an error and not a switch on my account! This looks like an issue for HyperScalper to weigh in on, since he has studied some of FinPro’s performance specs (versus Trader’s Way) in great detail. HyperScalper, if you’re reading this, what can you tell us? We’re always on the lookout for new additions to the Offshore Broker List. If you come across a broker we haven’t discussed previously (that is, one not already in Group 1 or Group 2 of our List), please do some checking to find out whether they accept U.S. clients. If they do, mention them here, so that we can give them a thorough vetting. And, thanks in advance! HotForex is in Group 2 of our List (brokers that do not accept U.S. clients). HotForex does not accept clients from the U.S., Canada, Japan, Sudan, Syria and North Korea.